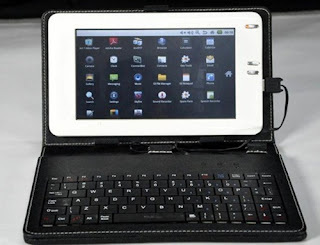 Cheapest tablet PC is about to arrive in market soon. Indian company Bharat Electronics Ltd (BEL) situated in Bangalore, has manufactured this PC which costs about Rs.3000 ($75 USD). Tablets market is not BEL main business but currently 2000 sample tablets were shipped in 4.5 months and are planning to produce 6 lakh tablets worth of Rs.1000 crores.It will not be a wonder if BEL starts its own venture. This tablet runs Android 2.2 Operating System and is solar powered for the power backup. Other specifications like processor speed,RAM Size, storage capacity are not known.This tablet will be used for poverty survey in India. HP TouchPad will it be a real competitor to Apple and Samsung ? Motorola ATRIX 4G : It's like a PC in your pocket. Samsung Galaxy S II special offer Hurry Up !! © 2011 Mr TechPathi All Rights Reserved.